If you’ve ever lived in New York, you know your threshold for good food is ruined forever. Other places you travel to are held to a culinary standard most can never match. How’s the pizza here? we ask, knowing it won’t be right. Can I get a fresh bagel? The city is a melting pot of cuisines familiar to any port city but is especially true for New York, which served as the entryway for so many of this country’s immigrants. That history is reflected in the wide array of foods available to us from fried rice to falafel. Vegan food as an extension of that variety is no exception — it’s convenient, accessible, and above all, delicious af. Below are the New York team’s favorite places to frequent (and some they are still dying to try). When I head out for a vegan meal, I generally lean into solid, filling grub and away from twee, “plant-forward” (read: expensive) offerings. I can craft a fancy salad at home, but I (and my tiny, tiny kitchen) lack the ability to whip up a burger or properly crisp a pizza crust. And I want something so delicious my meat-eating friends are impressed. The places on my list have both passed my test and have them — unironically — coming back for more. On the second floor up a narrow staircase (above Mother of Pearl, another great vegan place FYI) is this cozy little spot. Once there, you can lounge in a big armchair and sip creative rum cocktails paired with Cuban small plates. Don’t be afraid to take non-vegans there — I swear they won’t even notice. Get the Fiesta Platter and do not miss out on the fried (yes, fried) guac. An all vegan and palm oil free convenience store? Yes, please. Swing by Orchard Grocer for a tasty sandwich (the Bowery is my fave), cashew soft serve, and a variety if snacks to take home. P.S. Walk through the swinging doors to Moo Shoes, their all vegan shop next door. In my experience, there are not a lot of vegan French restaurants — something about the importance of cheese. But Delice & Sarrasin is the delicious exception. This West Village spot is small but worth crowding in (and they take reservations). Try the warm Brie as a starter and any one of the crepes for dessert. Ouiiiiiiii! A genuine NYC institution, Two Boots satisfies the all-important convenience quotient in that you can walk in any time and get a vegan slice. There’s no special menu, no waiting, just point and choose. They always have the V for Vegan and usually another option as well — their pies are all named after eccentric characters like The Dude, or my husband’s favorite, the Tony Clifton. They do use Daiya (sad face) though I would like to start pressuring them to explore other options now that so many exist. Even if you hate Daiya, the cornmeal crust and other toppings are so expertly done, it very nearly makes up for it. Since its inception in 1987, this quirky slice shop has grown to ten NYC locations, including my local on the Upper West Side. 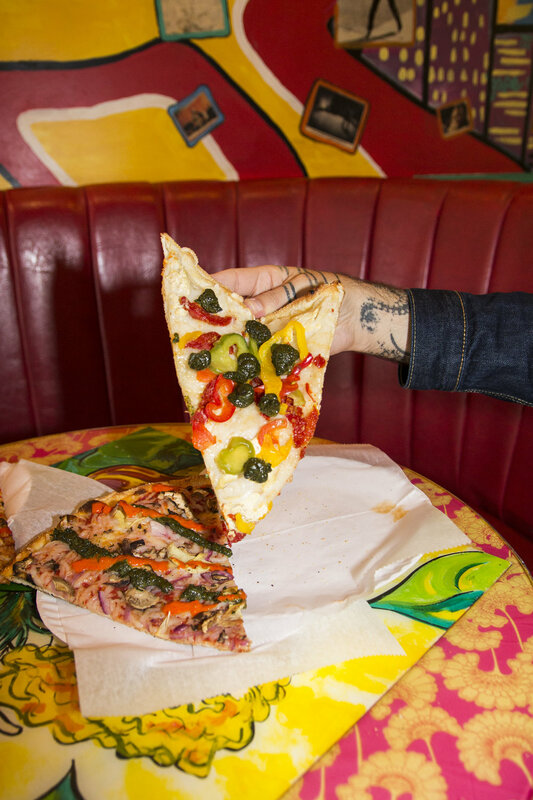 Two Boots also ranks high on Vegan Bodega Cat’s NYC Vegan Pizza Tour! Watch here. When I first became vegan (and was strictly gluten-free), this place was a godsend. It’s a reliable spot to get filling and healthy dishes that aren’t over-the-top or too expensive. Get the Peacefood Bowl with your choice of veggies or some very realistic chicken tenders. However, their baked goods are where they really shine — try the chocolate-dipped macaroons or any of the rotating flavors of scones and muffins they churn out each day. The OG is in my neighborhood on the Upper West Side, but they have a newer downtown location as well. Not all of my picks are totally vegan, and that’s for a few reasons: 1. I live in the Bed-Stuy / Bushwick area, and there’s just not as many vegan places as there are in Manhattan, it seems…. Because 2. I don’t eat out a ton (because 2 ½ I’m broke.) And 3. My friends aren’t vegan! So when I do go out, I want to compromise with my friends so we can all stay happy if I am eating vegan. Toad Style is 100% vegan, soy free, palm oil free (! ), and non-GMO. It’s total comforting junk food and hits the spot if that’s what you’re looking for. They’ve got those kinds of fries that are somehow sort of fried and crispy on the outside, too? So good. I recommend those, the buffalo cauli, and the bbq jackfruit sandwich! A 100% vegan cafe and bakery. Admittedly I’ve never been to their physical space, but I have had one of their pastries, an old-fashioned doughnut, at a nearby coffee shop, Heart’s (1207 Broadway, Brooklyn, NY 11221), which by the way has the best chai that I recommend you get with oat milk. As a pastry and bread lover, I’m excited to go to Brooklyn Whiskers and branch out from the doughnut and grab a muffin, tart, or brownie. They also have “real food” like avocado toast, tofu scram with potatoes, and sandwiches. This Vietnamese joint only has a handful of vegan options, and while I usually find Vietnamese food to be just OK, their vegan rice bowl, with sautéed Japanese eggplant, mushrooms, fried tofu, and house-made vegan walnut pâté, packs a punch of deeply satisfying umami flavor. I’m excited to go back and try the veggie summer rolls and crispy fried brussels sprouts.